Henry Otto Emil "Henry Jr." KINNE [Parents] was born on 16 Sep 1899 in Webster County, Iowa. He died on 4 May 1976 in Kossuth County Hospital. He was buried in Dayton, Webster County, Iowa. Henry Jr. married Elfriede LEISCHKE in 1969. Carl Louis Wilhelm ZANDER was born on 18 Dec 1843. Carl married Henrietta Wilhemine SEELEMAN on 28 Apr 1867. Henrietta Wilhemine SEELEMAN [Parents] was born on 18 Oct 1842 in Gräfenhainichen, Germany. Henrietta married Carl Louis Wilhelm ZANDER on 28 Apr 1867. Henriette Mathilde ZANDER was born on 1 Nov 1867 in Gräfenhainichen, Germany. She was christened on 10 Nov 1867 in Gräfenhainichen, Germany. Carl Louis ZANDER was born on 11 Dec 1869 in Gräfenhainichen, Germany. He was christened on 26 Dec 1869. M v Friedrich Wilhelm ZANDER was born on 1 May 1872. He died in 1939. Friedrich August LORENZ. Friedrich married Friederica Juliana SEELEMANN. The marriage ended in divorce. Friederica Juliana SEELEMANN [Parents] was born on 16 Feb 1805 in Gräfenhainichen, Germany. She was christened on 19 Feb 1805. Friederica married Friedrich August LORENZ. The marriage ended in divorce. F i Henrietta Wilhemine SEELEMAN was born on 18 Oct 1842. John VASSAL II [Parents] died in 1625 in Essex, England. John married Anne RUSSELL in 1593. Anne RUSSELL. Anne married John VASSAL II in 1593. M i William VASSAL was born on 27 Aug 1592. He died on 13 Jul 1655. John VASSAL II [Parents] died in 1625 in Essex, England. John married Anne HEWES in 1569 in England. Anne HEWES. Anne married John VASSAL II in 1569 in England. 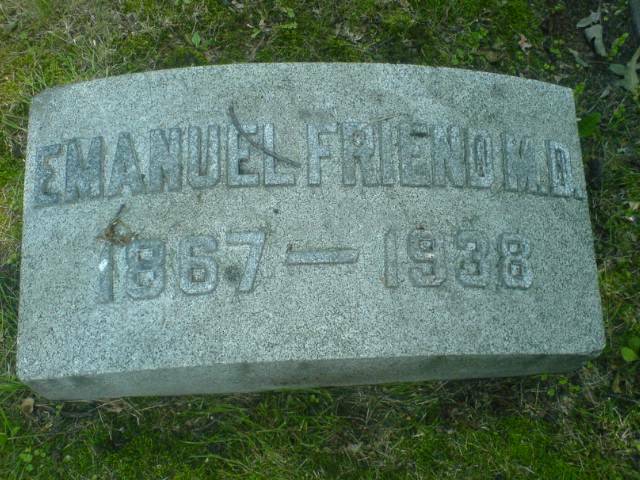 Emanuel FRIEND [Parents] [scrapbook] 1, 2 was born in 1867 in Chicago, Cook, Illinois. He died on 19 Jul 1938 in Chicago, Cook, Illinois. Emanuel married Magdalen LANSKOP. Magdalen LANSKOP. Magdalen married Emanuel FRIEND.